so i got this WB used, no directions. fack. so the gauge itself has a red and a black wire comin off it. it also has 2 female headphone looking jacks. then, from the LC-1 has 2 MORE female jacks, along w/ a mess of wires. the green is tied together with the white, the yellow, black, and brown ends are looped like they aren't used, then there's the red and blue ones. also, do i hafta splice some wires into the ECU?? If that really is a wideband, there should be also a o2 sensor-looking thing that should be welded in before the primary o2 sensor(or before the cat-converter -if you have one). I've got this wideband in my car as well. Took me quite a while to figure it out. Email me at deafy03 at yahoo.com and I'll send you the instruction manual. Yea thats the manual... Is the gauge XD-16? You'll probably need the manual for the XD-16 as well. Let me know where you're stuck at with the wiring and I'll take a gander at my wiring and let you know what goes where. I can't really help you with the gauge part, but I can help with the sensor wiring. yep, gauge is the XD-16. would you be able to tell me where you hooked all your wires up to? Yea I'll help you out. Connecting the XD-16 should be through the headphone jacks. It should go from the controller's "out" to gauge's "in". I'd double check the XD-16 manual before doing this. My gauge is different and gets the readings from the brown wire off the controller. Green and White should be grounded together while blue grounded at a different spot. I hooked up a longer wire to the blue and grounded somewhere in the engine bay while the green and white are grounded inside the car. Thats what I remember now, the rest I'll have to check later since I'm not home now. Did you get your wideband all figured out? nope. 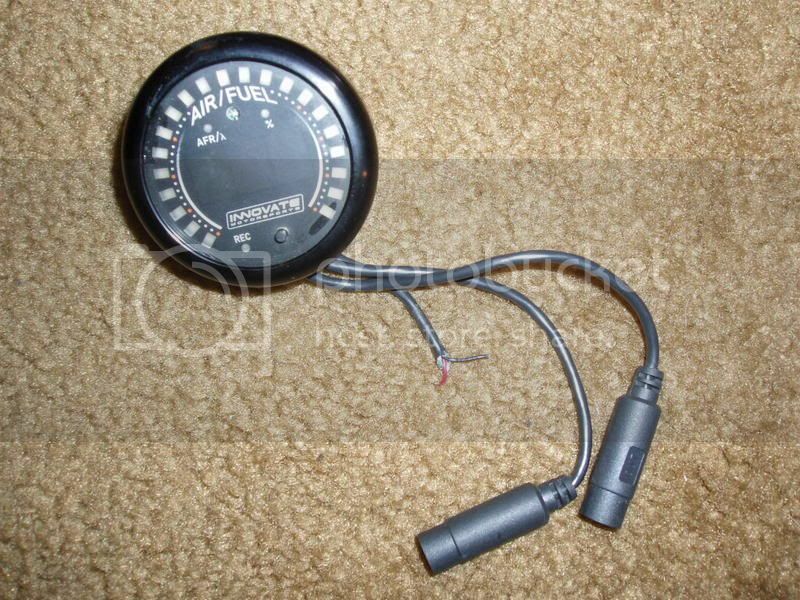 for the 5 minutes that she was running, the gauge just read "- -"
this might be due to i dont have the correct male-male connector to hook the gauge to the LM-1, or i wired it wrong. red wire is going to a fuse, blue is grounded to the control arm nut, and the green and white are grounded to the firewall. Seems you've got it wired up right. Are any of them wired to the ECU? Did you do a free-air calibration? to do a free-air calibration you have to completely remove the o2 sensor... press the calibration button, light goes out for a second and comes back on... then reinstall the o2 sensor, start it up and go. Make sure you have the "headphone jacks" plugged to the correct port. the controller's "out" goes to the gauge's "in". You might need to use the terminator plug on the "out" end of the xd-16 unless you have that end plugged into a laptop to program it and such.